A bulb for every citizen of Amsterdam! The tulip is one of the most known symbols of the Netherlands and Amsterdam. Originating from the Ottoman Empire and introduced to Dutch merchants at the beginning of the 17th century, it has had a lasting economic impact from the Golden Age to the present day. Amsterdam is traditionally connected to the legendary tulip; however, the bulb seems to have vanished from the streets. Therefore, Tulp Festival Amsterdam 2015 (from April 1 – April 30) wants to bring back the tulip in the city streets with the aim to eventually plant one tulip for each individual citizen of Amsterdam. This amounts to 800.000 tulips, a dream that simply has to come true. This year, 423.207 tulips were planted. This amount is increased by 116.074 tulips planted in pots. For this first edition of Tulp Festival Amsterdam, a number of interesting public locations in the city were selected as well as a couple of gardens at remarkable buildings in the city areas south, centre and north. Last fall, thousands of bulbs were planted, which will bloom during the month of April. Participating locations Tulp Festival Amsterdam 2015 include Artis Royal Zoo, EYE Filmmuseum, Hermitage Amsterdam, Hortus Botanicus, Museum Van Loon, Rijksmuseum and many public spaces throughout the city. 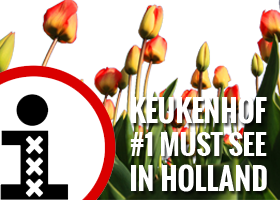 Visit the Tulp Festival website for more information about Tulp Festival Amsterdam 2015. If you want to see some more tulips, try to visit the world famous Spring Garden Keukenhof as well.